Our very first album, released in 2006! Our books and music CD's are truly unique. We usually ship them in 2-3 days by USPS unless you require another carrier. If you have any questions regarding our products or would like more information regarding larger quantity pricing and shipping costs, please contact us. Anishinaabemowin the way it is said when spoken. What will help you as you begin to speak the Anishinaabe Language. The Students' Edition is highly recommended as your first purchase. It is for bilingual learners and speakers. The Teachers' Edition comes with 2 Audio CD's, but everything is spoken in the language. It would be most useful for a fluent person who is beginning to teach. 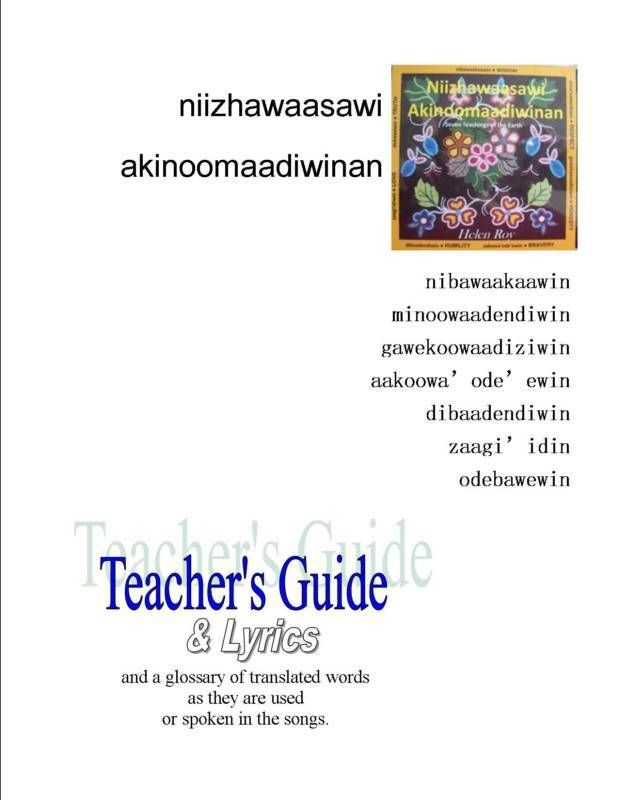 A student should purchase the Teachers' Edition only in order to hear the language as it is spoken by a person who thinks in Anishinaabemowin. It is also very useful as a resource to gauge how much understanding of the spoken language has been achieved. Our second album, released in 2006. Splish Splash, It's Diiva's Dance Party! These songs are about what have been called the Seven Grandfather Teachings. The lyrics of these original songs are drawn from the philosophy of the teachings. The true meaning of the teachings can be found by really knowing what the words are saying in Anishinaabemowin. For example, the word "zaagi'idiiwin" talks about sharing a part of your inner self with another person rather than the English equivalent "love" which has a very vague definition which must be looked up in the dictionary to discern its meaning. ​This booklet and CD set is a study of the words from the lyrics that a teacher or student could use to assist them in learning. It includes a Cd of back-up music which can be used to sing along in practicing the pronunciation of the words and the way they are sung in CD-8. You must buy CD-8 also for this set to be useful, since the original songs of CD-8 are not sung on this audio CD, it is only the music. Released in 2010. Booklet/Audio CD set. 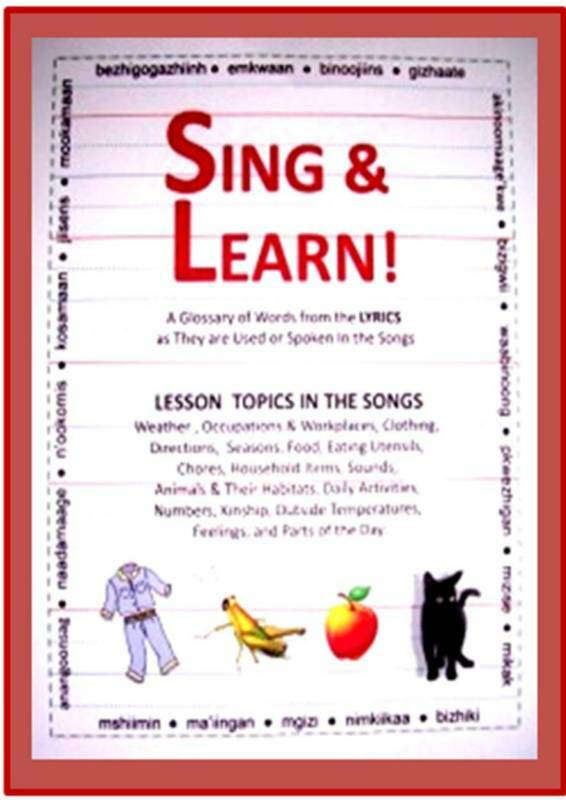 These are curriculum-based original children's songs written about things commonly taught in the classroom. Topics covered include more than just what the titles refer to. For instance, the song "one Day" teaches about "parts of the day, directions, and outside temperatures". All songs are written with a lot repetition that children become accustomed to, in order to learn what is being taught to them. The music is fun to sing to. There is even a "rap" song, Numbers/counting covering numbers 1-10. The Relations songs are very interesting to many learners. The terms for relatives are different from a male's point of view compared to a female's point of view. has sample lesson plans and a back-up music CD. You must also purchase CD-10 in order to use this set. "When are you guys gonna do some Johnny Cash?" Ahaaw, 9 are on this album! We also included some Buck Owens songs, a Patsy Cline , Everly Brothers and one Elvis song. When we perform, the Elvis songs are always a crowd favorite. This album has 7 that we haven't covered before, plus 2 of our favorites re-issued. We also included a cover of a Paul Simon song, a Harold Arlen song from a favorite movie,and an old r&b favorite. Oh, and Helen sings a little German. All of the songs are sung in Anishinaabemowin! 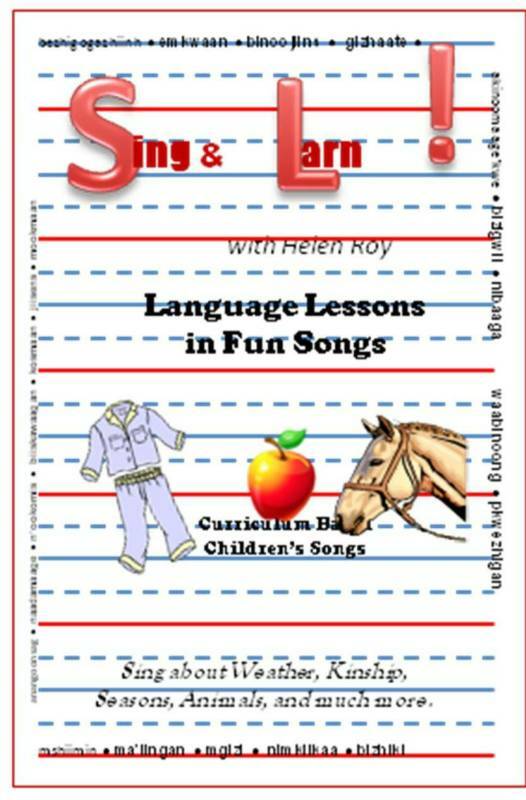 Booklet and Audio CD of music with no singing for students to sing along. Purchase CD-10 also in order to use this. This includes the backup music and lyrics for CD-8. Have your class learn a song and present to the community! Simple Reader 1: What is the little girl doing? The actions shown in these pictures may be spoken about in many ways. The words chosen here are routine action words which will be heard and spoken by a child in an immersion environment. There is an English translation provided at the end of the 16 lesson pages of the booklet. An audio CD is provided with Helen reading the words slowly so that the student can hear the complete sounds before speeding up in everyday use. These are not be story books. All of the simple readers follow a theme. Each page is useful as an independent lesson. The teacher can expand the lesson to include other discussions of the sounds using similar words which are suggested by the actions in the pictures. The simple readers are useful for all beginning students, not just elementary students. At first the teacher can read the books to the students. Independent students at home can listen to the CD and read along. Available at The Store, scroll down, look in the "Books" section. Simple Reader 1 answers the question and adds comments about what is seen in the pictures. Look at the sample page at far right: "The little girl is thirsty. The little girl is drinking water. The water is nice and cold." These are three simple sentences suggested by the action seen. Simple Readers are for students of all ages who are learning to read the langauge as they learn to understand and speak the language. What I Will Say to My Baby Girl! What I Will Say to My Baby Boy! Parents can listen to the CD and read along , practice these words, and be ready when the new baby arrives. Parents of students taking the language should become familiar with these words that their child is learning in school. These booklets cover the daily routine commands, the instructions to "put on your coat", "put on your shoes", and so on. The parent can learn to ask "Are you hungry?" "Are you thirsty?" "Don't do that!" "Put your shoes on!" "Let's go to grandma's place!" "You're not to play with that!" "Open the door!" "Did you finish eating?" Over 190 common everyday real sentences! There is a section on weather, too! The audio is in Anishinaabemowin, there is an English translation of every sentence in the booklets. Children do not need to be told the translation, just use the sentences at the appropriate times and you will see that they will soon understand. This is a tried and proven method which is used in immersion environments; it is how the original speakers of Anishinaabemowin learned the language in see and say situations. Adults can use these words in everyday situations, this is a wonderful introduction to the spoken language. Simple Reader 2: This is what I do every day! 16 full color action photographs. ​The sentences are shown at the right. Oh, the ups and downs of love are covered in songs by everyone from Loretta Lynn to Tom Petty in this album. The Oldies were especially fun to record and we hope you find them just as much fun to listen to. ​We are not really asking for donations, so please pick a product instead! This "Donate" button is primarily intended for those customers who have purchased some materials and want to pay by credit card instead of mailing a cheque. I haven't yet found a way to put a "variable amount" button together... Please send me a note describing what you are paying for, invoice number, PO number and whatnot. Any real donations will go toward paying our bills so we can keep making the resources. We do not receive any grants to do this, we are self-funded. We are not a non-profit entity, so the donations will be treated as regular income by us and are not tax deductible by you. Buy something! Due to popular demand, we have produced this Karaoke DVD so you can easily learn to sing along with us! Unlike a regular Karaoke DVD, this one includes Helen and David singing the songs as well as the backup music from the album that you can sing along with. The lyrics are in Anishinaabemowin only, there is no pesky English to confuse the singer. After a few times singing along as you read the lyrics on the screen, you will be ready to amaze your friends as you sound like a fluent person. Teachers, this would be a wonderful way to showcase your class at the next community gathering, especially when some folks are trying to cut your funding! 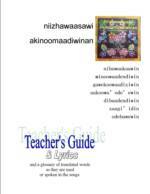 This set is designed to use with the textbooks on the Sound Based Method of Understanding Anishinaabemowin. Each consonant and vowel is the focus of a video. Each consonant/vowel combination is covered, in words spoken by Helen. Some discussions of the target concepts are heard along with the key words used to describe the concepts. The students can look at the key words and concentrate on the true meaning of the sounds spoken instead of the standard English one word translations which are very inaccurate. Watch this sample video, part of the focus on "b". Someday You'll Call My Name Hank Williams Sr.
Scroll down below the store for more product descriptions. You can print this order form, fill it out, scan it and e-mail it to us at helenroysongs@hotmail.com We will process your order and send your purchasing department the invoice.